Natural color range shown from medium brown (#4) on left; to dark brown (#1B-#2) on right. Currently, we order natural hair ranging from a light medium brown (#8) to a dark natural black (#1). Ordering virgin hair means ordering hair that has its natural highlights and lowlights due to the donor's exposure to the sun. Wearing the hair in it's natural color state adds to the realistic look of the hair. Color can be requested, but not guaranteed. 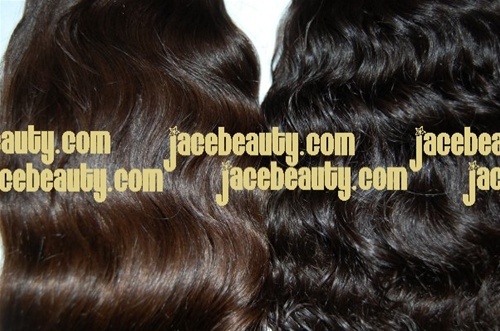 For example, if a customer wants a light medium brown; however, we only have dark brown colors at the time- that customer will receive dark brown bundles. Please be prepared to dye the hair if you have specific requirements for color. Due to this product being raw and natural, colors of each shipment we receive cannot be predicted. If you are looking for finer, European textured hair in blonde to auburn color ranges, please contact us directly for pricing and delivery expectations.